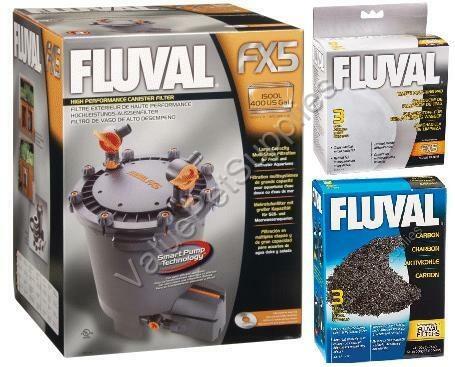 The Fluval FX5 is a large capacity, multi-stage external canister filter system. Fluval FX5's massive capacity and powerful integrated motor processes and recirculates 607 U.S. gallons (2,300 liters)of water every hour, enabling precise management of water conditions for aquariums as large as 400 U.S. gallons (1,500 liters).Fluval FX5 features include:- A self-priming instant-start system that eliminates the need for manual siphoning.- Unique click-fit AquaStop Valves that regulate water flow, rotate at 55 degree angles and allow for fast set-up and leak-proof maintenance.- An innovative multi-functional aquarium rim connector to easily secure hosing in place.- A convenient clog-free strainer to prevent build-up of solids that could impede water flow.- A purge valve that allows for partial discharge of debris without needing to move the unit.- Multi-directional twin output nozzles tp create specific water flowsFree Carbon & Polish Pads IncludedFluval Carbon 100 gram 3/pk nylon bags Filter Media300 g3 nylon bags each packed with 100 gFluval carbon is very pure activated carbon that is ideal in both Fresh and Salt water. The inner matrix structure provides a large porous area that permanently traps organic waste while removing liquid wastes such as urine, dyes or many other impurities from the water. The result is sparkling clear aquarium water.Fluval Carbon premium, research grade, low-ash carbonimproves water clarity andcolor, while also removing odors. Highly porous, it provides large amounts of surface area for adsorption of impurities. It effectively removes heavy metals, odors, discolorations, organic contaminants, and pollutants to leave your aquarium water crystal clear and sparkling. This product does not release phosphates. Carbon loses its activity without outward sign. Replace monthly to ensure that active absorption is maintained.Carbon should always be removed when medication is being administered in aquarium water. Also, because carbon will adsorb a large percentage of the nutrients in plant fertilizer products, it should be used carefully when keeping live plants. For freshwater and marine environments.Premium select media for use in Fluval Canister Filters, ideal for all filters.Fluval Water Polishing Pad For Fluval FX5 3PKFluval Water Polishing Pads are uniquely designed to fit Fluval FX5 High Performance Canister Filters. These extra thick micro- fine polyester pads effectively trap micro particles and debris as water passes through. Fluval Water Polishing Pads are ideally used when cloudy water occurs or after tank maintenance to provide crystal clear aquarium water. 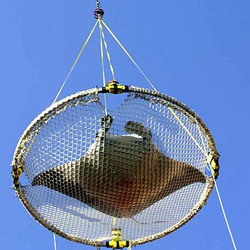 For freshwater and marine environments.